A Palestinian civilian was killed, and 3 others, including a child, succumbed to their wounds. 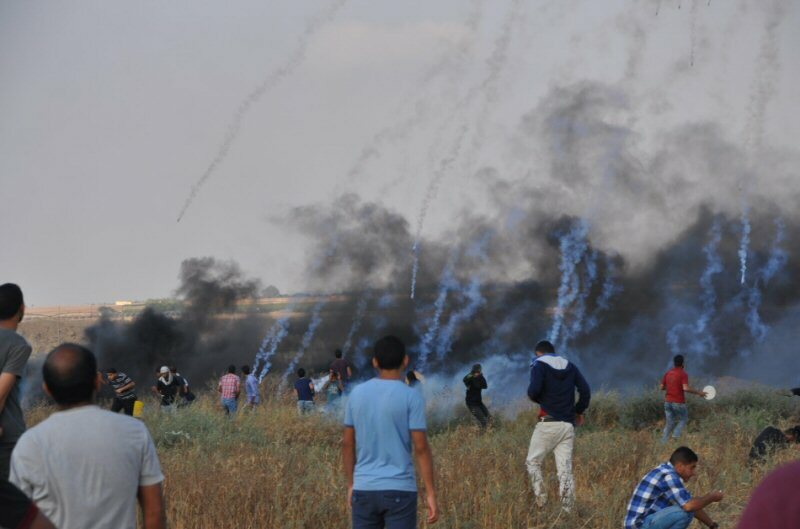 8 Palestinian civilians were wounded in the Gaza Strip, while 3 Palestinians were wounded in the West Bank. Israeli warplanes carried out many air strikes against many targets belonging to armed Palestinian resistance. Israeli drones also targeted Palestinian civilians gathering in the peaceful demonstrations. At approximately 13:30 on Friday, 15 June 2018, a group of Palestinian civilians moved from Kufor Qaddoum village, northeast of Qalqiliyah, to the eastern entrance to the village, which has been closed for 15 years in favor of the entrance to “Kedumim”settlement established on the village lands. The protestors chanted national slogans demanding end of occupation, condemning the U.S President Donald Trump’s decision to recognize Jerusalem as the capital of Israel and condemning the Israeli forces’ crimes against Palestinian protestors along the eastern border of the Gaza Strip within “The Great March of Return and Breaking the Siege” activities. The protestors set fire to tires and threw stones at Israeli soldiers stationed behind sand barriers. The soldiers fired rubber bullets, sound bombs and tear gas canisters at them. As a result, many civilians suffered tear gas inhalation. The Israeli forces arrested Hamam ‘Adnan ‘Ali (22) and Omer Walid ‘Ali (20). They also raided and searched 2 houses belonging to Mohammed Tahah ‘Amer and Abdul Rahim ‘Ali and later withdrew.